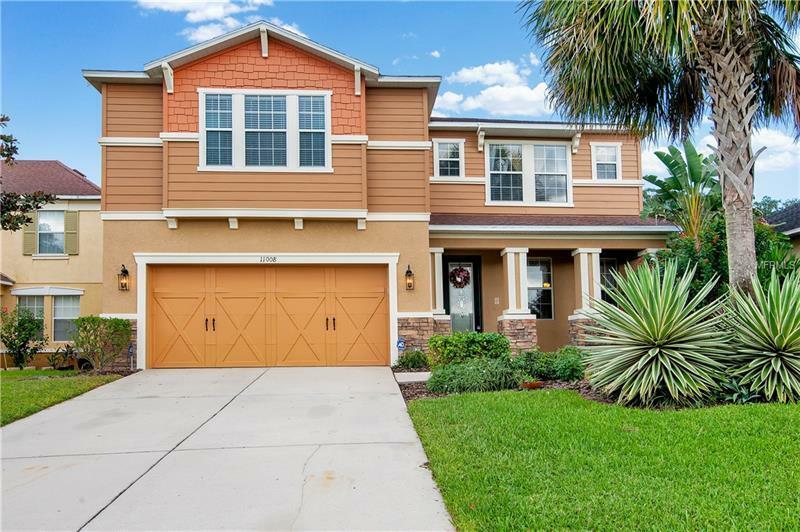 Absolutely beautiful move-in ready home. Stone front single-family home full of character and charm. All you need to do is relax and enjoy the Florida weather. Subdivision is a private gated community located on a quiet and very safe street (cul-de-sac). Former model home with options and upgrades galore, an open first floor plan featuring the kitchen, living room, dining room and pool view. Bedrooms are large with an oversized Master with an en suite, which includes a HUGE his/hers California closet. Screened-in Pool (Lanai) the perfect oasis for relaxing. Well-manicured/spacious yard backing to a conservation wetland and pond. Perfect for a growing family. Great school district. Close to shopping and entertainment. Home originally built as the "show model" for the subdivision with all the major upgrades to include top-of-the line kitchen/appliances/ countertops, 2 full bathrooms with both tubs/showers and double-sinks upstairs and a lovely powder room downstairs with beautiful hardwood floors. Immaculate home--A MUST SEE. Fresh new paint interior and exterior. Courtesy of Real Property Marketing, Inc. Copyright © 2019 Mid Florida MLS. All rights reserved. The data relating to real estate for sale on this web site comes in part from the Internet Data Exchange Program of Mid Florida MLS. Information provided is for consumer's personal, non-commercial use and may not be used for any purpose other than to identify prospective properties consumers may be interested in purchasing. Real Property Marketing, Inc participates in the MFRMLS Internet Data Exchange (IDX) program, allowing display of other MFRMLS broker's listings on this site. However may not include all listings currently available. Information is deemed reliable but not guaranteed. Information last updated at 2019-04-22 18:45:50.